NEARING THE END. . . .
August 9, 1999 . . . .
1. 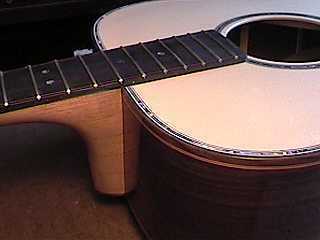 To figure out the saddle location, I measured from the nut to the middle of the 12th fret. 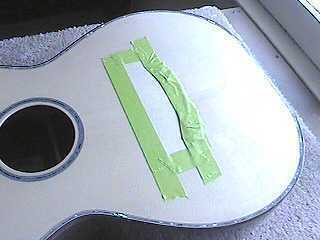 I used that measurement to measure from the middle of the 12th fret onto the top, then added .15" for compensation. That final location is the location of the middle of the saddle. Once that was figured out, I put a piece of masking tape at the front of the bridge. 2. 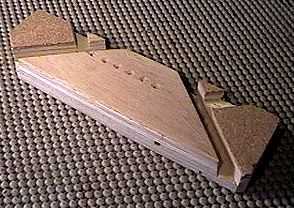 To make sure the bridge was parallel to the frets, I then positioned the bridge until both front corners were the same distance from the ends of the 14th fret. I placed masking tape at the front corner edges. 3. Finally, to make sure the bridge was centered, I positioned the bridge until the bridge pin holes were centered between two rulers placed flat along both sides of the fingerboard. I placed masking tape along the ends of the bridge. Once that was all done (and everything double-checked), I firmly held the bridge down with one hand and scribed around the bridge with an Exacto knife. I then placed three layers of masking tape along the scribed lines, before using the same paint stripper method of removing the finish. August 8, 1999 . . . . 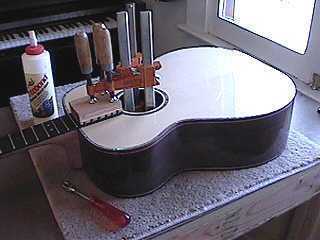 Here I am gluing the fingerboard extension only. I have first removed the finish from the top, underneath the extension. To do this, I first scribe with an Exacto knife around the fingerboard extension, then use paint stripper to remove the finish within the scribed area. Then, with a 1/2" chisel, I carefully scrape away the melted finish, wipe the area with some water to neutralize the stripper, then let it dry for about half an hour. Then I bolt on my neck (no glue at the neck joint! 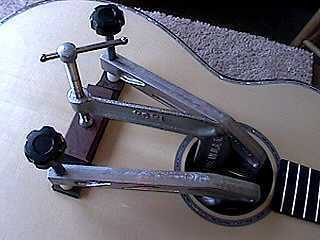 ), put Titebond glue on the fingerboard extension, and clamp it down, using cauls for both above and below the surface. Below, I am gluing the bridge. I have a bridge caul underneath the top at the bridge location, to protect the top from the clamps, and curved cauls (with sandpaper on the bottom to keep them from shifting) to protect the bridge. Actually, the green masking tape you see in the photo to the left is left on until after I have glued and clamped everything down. The masking tape serves to hold the bridge in position until the glue sets up a bit. When I am sure the bridge won't move, I remove the tape, so that I can deal with the glue squeeze-out. I use a small artist's brush and warm water to soften and remove any glue squeeze-out.